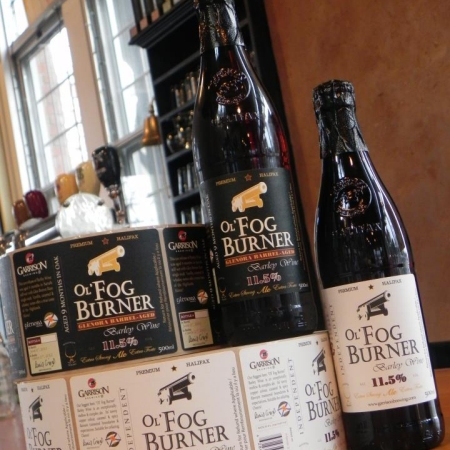 HALIFAX, NS – Garrison Brewing has released the 2012 edition of their Ol’ Fog Burner Barley Wine, and as it was last year, it’s accompanied by a limited edition variation aged in whisky barrels from the Glenora Distillery. Both versions check in at 11.5% abv, the highest alcohol level so far for this annual spring seasonal offering. And in another change from last year, the barrel-aged version was aged for 9 months rather than the 11 months than previous version spent in the wood. The regular and barrel-aged editions of Ol’ Fog Burner are available now in 500 ml bottles at the Garrison retail store while quantities last.